For 23 seasons, more than 20 million fans have piled into stadiums all over the country to see ‘Fletch’ play over 400 games for his beloved Essendon Bombers on the way to becoming a legend of Australian Rules football. Just like the book that was released last year, Fletch is the story of a teen superstar, prodigal son, youngest member of Sheedy’s famous flag-winning ‘Baby Bombers’ and heroic yet humble defender of the realm against the greatest goal-kickers of all-time: Ablett, Lockett, Dunstall, Kerhahan, Modra, Hall and Franklin. Dustin has an extraordinary tale that reflects on dizzying highs – the epic 2000 premiership run, joining the ‘400 Club’ – and cataclysmic lows, including a jaw-dropping insider account of the ASADA drug crisis that has rocked Essendon and the AFL to its core. 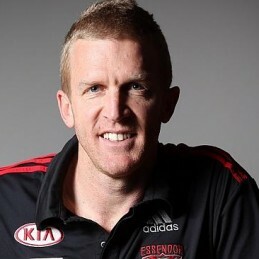 Dustin Fletcher was born a long torpedo punt from Essendon’s home ground of Windy Hill and has been an Australian Rules footballer for his beloved Essendon Bombers since 1992. As the son of former Bombers captain Ken Fletcher, it seemed Dustin’s destiny to wear the red and black jumper. In 1993 he debuted in the AFL as a gangly 198 centimetre 17-year-old schoolboy with legendary coach Kevin Sheedy’s ‘Baby Bombers’, matriculating that same year with an AFL premiership. So began an extraordinary journey that has seen Dustin become one of the modern era’s greatest defenders. Dustin has won two premierships (1993 and 2000), twice been named in the All-Australian team (2000 and 2007) and has represented Australia four times in International Rules, the second appearance as team captain. Aside from his incredible defensive skills, Dustin is one of the longest and most accurate kicks in the AFL. In 2007 one of his torpedo punts traveled more than 70 metres to goal. According to The Sunday Age, it was the fifth longest kick in the history of the VFL/AFL. Dustin and his father, Ken Fletcher, hold the record for most games played by a father and son (657). Dustin became Essendon’s games record-holder in 2014 when he played his 378th game and at age 40, played his 400th game in 2015 and move to third on the AFL’s all-time games played list. Dustin is available to speak about his amazing AFL journey at your next event.